Checking Out: After three decades of providing curbside check-ins at Santa Barbara Airport, come August 31 skycap Mike Adriansen will no longer be a familiar helping hand. Pinch-penny airlines that paid him figure they can do without Mike’s services, even if many passengers can’t. “I think (the airlines) are fighting for their economic survival,” Mike told me. 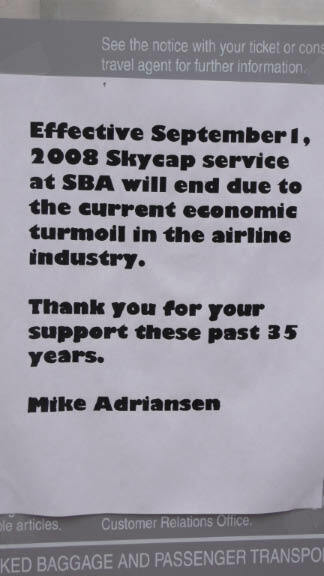 At one time, airlines using the terminal chipped in to cover Mike’s liability costs, workman’s comp and minimum wage, but they have dropped off, one by one. Skywest was the only one left, and as of the end of August, it’s signed out. Mike hefted his first bag out there on March 31, 1978. “I’ll sure miss the people out here,” he told me. “It was like a family.” People like the UCSB freshman girl he assisted years ago and whose daughter Mike helped when she arrived at the college. “It has been an honor and a privilege to be of service all these years. Community reaction so far has been one of disbelief, with civic and business leaders calling to express their sense of disappointment at the decision the airlines have made in discontinuing this service,” Mike said. But Mike isn’t gone yet. He’ll be working an abbreviated schedule for the next few weeks, Tuesdays and Thursdays, 5 a.m. until 11 a.m. After his skycap days are over, Mike’s not sure what he’ll be doing but he’s got some irons in the fire. “I’m optimistic.” I watched Mike help some frail seniors with their luggage. From now on, folks like these will be on their own. Boathouse Opens: Not only has the new Boathouse restaurant opened at Arroyo Burro Beach Park, but its sign has preserved the traditional name for the park: Hendry’s Beach. The moniker happily lingers with locals, stemming from the name of the Hendry family that farmed the area many decades ago. The eatery, now run by the same folks that operate Santa Barbara Shellfish at Stearns Wharf and the Fishouse restaurant on Cabrillo Boulevard, is a vast improvement over the old place. The menu is extensive, and the service was excellent when I stopped by Tuesday, August 19. The wine list was appealing and the new bar offers wonderful views of the beach and ocean. This is going to be a popular hangout, as well as a tourist mecca. Water Wars (Continued): This is sure to spark legal action: Goleta Water Board candidate Bill Rosen is charging that the board plans to unilaterally kill the 1991 SAFE water supply ordinance at its Wednesday, August 20, meeting, paving the way for unlimited development. Rosen, an attorney, is arguing that the 1991 law requires a vote of the public to amend or modify it. “The board cannot take the action on its own,” he said. The SAFE measure was aimed at providing a buffer in the central basin aquifer to be used for existing customers in the event of drought years, he said. If the board majority eviscerates the ordinance, “the consequences of the declaration would be to free up water for development with no concern for the future,” Rosen said. “This is just another example of the board acting secretly through ad-hoc committees to make secret decisions and then at the last minute present them for action with little or no public input.” Rosen said Wednesday’s meeting will be at 7 p.m. at the Goleta Water District offices, 4699 Hollister Ave. at Puente. Gone to the Dogs: I love dogs as much or more than anyone. Same for most dog owners — except for the few unidentified owners who take their pooches for strolls down my street, making no effort to clean up after their pets. The other day our street was virtually paved with caca. (Sue picked it up. “That’s not your obligation,” one dog-less stroller advised. Yeah, but it’s our street.) It’s odd, because we’re good friends with the regulars who pass by daily, and who always carry a plastic bag for cleanup. Some suggest that these are just pooches allowed to run loose. Fess’s Chef: Ron Stewart is the new chef at Restaurant Marcella, at Fess Parker’s Wine Country Inn at Los Olivos. Friday night menus are themed to classic films being screened there. Sullivan’s Travels will be shown Friday, August 22, and It Happened One Night on August 29.